Quality salon furniture. Salon furniture for sale at Regal USA. Have the most stylish salon around with this high quality, modern salon and stylist sink straight from Italy. With this structure, seat and backrest in polyurethane foam on a metal and wooden chassis, wide skai colour range available, electrocoated metal shelves, oscillating porcelain basin and optional leg rest, this sink is beautiful and functional. Have the most stylish salon around with this high quality, modern salon and stylist sink straight from Italy. With this structure, seat and backrest in polyurethane foam on a metal and wooden chassis, wide skai colour range available, electrocoated metal shelves, oscillating porcelain basin make this sink is beautiful and functional. 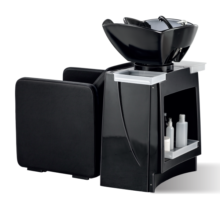 Have the most stylish salon around with this high quality, modern salon and stylist sink straight from Italy. With a backrest, seat and armrests in polyurethane foam on a wooden and metal chassis, wide skai colour range available, fiberglass structure, white or black, swinging ceramic basin with adjustable junction and multipurpose trays this sink is beautiful and functional. Have the most stylish salon around with this high quality, modern salon and stylist sink straight from Italy. With a polyurethane foam monocoque on metal chassis, wide skai colour range available, Chassis in ABS and nylon, available in white or in black and oscillating porcelain washbasin this sink is beautiful and functional. Have the most stylish salon around with this high quality, modern salon and stylist sink straight from Italy. With a backrest, seat and armrests in polyurethane foam on a metal and wooden chassis, wide skai colour range available, Chassis in ABS and nylon, available in white or in black and oscillating porcelain washbasin this sink is beautiful and functional. Have the most stylish salon around with this high quality, modern salon and stylist sink straight from Italy. With a polyurethane foam monocoque with polypropylene chassis, wide skai colour range available, Chassis in ABS and nylon, available in white or in black and oscillating porcelain washbasin this sink is beautiful and functional. Have the most stylish salon around with this high quality, modern salon and stylist sink straight from Italy. With monocoque in polycarbonate or polypropylene in different colors, foamed cushion with multilayer wooden insert, Chassis in ABS and nylon, available in white or in black and oscillating porcelain washbasin this sink is beautiful and functional. Have the most stylish salon around with this high quality, modern salon and stylist sink straight from Italy. With Monocoque in polycarbonate or polypropylene in different colors, Chassis in ABS and nylon, available in white or in black and oscillating porcelain washbasin this sink is beautiful and functional. Have the most stylish salon around with this high quality, modern salon and stylist sink straight from Italy. With the backrest, seat and armrests in polyurethane foam on a wooden and metal chassis, wide skai colour range available, fiberglass structure, white or black, swinging ceramic basin with adjustable junction and multipurpose trays this sink is beautiful and functional. Have the most stylish salon around with this high quality, modern salon and stylist sink straight from Italy. With a backrest, seat and armrests in polyurethane foam on a metal and multilayer wooden chassis, wide skai colour range available, column in ABS, available in white or in black and oscillating porcelain washbasin this sink is beautiful and functional.